On my first trip to Chiang Mai in 1990, we followed the arts and crafts route just outside the city: Our afternoon consisted of visits to the Woodcarvers’ shop, the Silk Factory, the Silversmith and, my favourite, the umbrella workshop. Called “Baw Sang Village”, after the Thai word for umbrella. We were shown the steps to making a silk-cotton umbrella, including the final stage of painting the colourful and sometimes elaborate designs. At the end of our tour, the guide announced that if we had any cloth that we wanted to have painted, the artists would do so and accept any fee we thought to be appropriate. I gave one of the artists my new grey daypack and asked to have a dragon painted on it. Fifteen minutes later, my pack was graced with a beautiful red, blue and white dragon, floating in the clouds, with a fierce yet somehow peaceful look on its face, and an awesome stream of fire emanating from its mouth. The dragon was my first choice, not because it was a fearsome creature that would scare off potential back-pack thieves and annoying children, but in Asia, the dragon represents wisdom, power and protection, and as a traveller, I felt that a dragon on my back would be a type of guardian spirit looking out for me. I was not that far off in my interpretation. Although the origin of dragons is a bit muddled, there seem to be two branches of dragon mythology. The European word “dragon’ is said to have originated from the Greek word ‘drakein’, meaning ‘to see clearly’ and was seen as a mythical beast protecting the treasures of the King. The Asian dragon, is more associated with imperial power, which in turn derives from the dragon’s connections with the forces of nature: controlling water, rain, floods and storms. In fact, some believe that the Chinese word “long”, meaning ‘dragon’, is onomatopoeic for the clap of thunder heard during a rain storm. In the true spirit of globalism, we can see how the two branches of dragon-origins have meshed, somewhat. In the popular TV show, the Dragon’s Den, we see would-be entrepreneurs pitted against fearsome but powerful and wise tycoons who have the ability to make, or break or embarrass the contestants. In the spirit of the Chinese Year of the Dragon, we can see how wisdom to prosper, to control, to make firm decisions, to be a ‘doer’ and realize goals, becomes the characterizing feature of those not only born in the Year of the Dragon (in recent times this means every 12 years since 1904) but also of those living, working and looking to achieve tangible results in 2012. The travel industry needs to walk into the dragon’s den (not the TV show, but the figurative ‘den’ of power), with head held high, and finish the year, not with regret that they have to wait for another 12 years to do it again, but with pride that they have learned the lessons that will make every year dragon-esque from here on in. 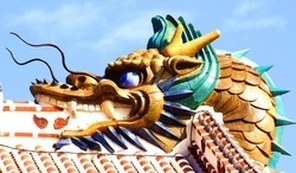 If knowledge is the root of power, then let the Year of the Dragon be the year for travel professionals to acquire the tools to master the skills that will lead them to success. Moreover, if knowledge is the root of power that evokes wisdom and idea-generation, then make this the year to stay tuned to new industry trends. Certified professionals have identified luxury travel as a key area of growth and one that also demands expertise through training and education. European river cruising and cruises in general are still growing in popularity and are therefore a must for every travels seller to have detailed knowledge. Niche markets, another area of growth, not only cater to the needs and interests of travellers—and travel groups—but also require the care and expertise that only a trained travel professional can provide. Family travel (cross-generational) which goes along with the need for safe, secure and worry-free travel experiences, is in huge demand but requires specific skills and knowledge to be successful. Again, this is the domain of the dragon-travel counsellor—trained professionals who are ‘do-ers’ and want to succeed. And let’s not forget the positively frenetic pace at which social media and technological changes bombard our in-boxes every day. Use your dragon insights to decide what media channels work best for your audience and then learn how to master those areas from a marketing, self-promotion, celebrate-success and customer service point of view. The ability to see clearly, the original meaning of the word ‘dragon’, is in high demand these days. Looking after your back (and looking out for your client), is what will keep the travel industry strong and focused. And playing on the mysticism of the dragon in the clouds, is the imaginative impetus and source for inspiring creative solutions to the many challenges we face on a daily basis. On ancient maps, notations on the outer fringes of the known world, said “Here there be dragons”. This meant that if one ventured too far away from common knowledge, one would be at the mercy of creatures that could pose untold risks. Now jump ahead to the year 2012 and celebrate your dragon-hood with the updated version of this tale. Serious travel professionals should consider posting a sign on the front door proudly proclaiming :“Here there be dragons’ Explain to your clientele that the dragon-mentality that you and your staff have adopted, means that you have acquired industry wisdom to powerfully look after your clients before, during and after their travels, and to creatively stay on top of changing economic, political, social and technological challenges. This is why YOU are the best option for customers when it comes to their travel needs. Create your own dragon’s den and breathe fire into your chosen career.